Nurses Appreciation Week is May 6-12! From Chick Fil A Nurse Week specials to Nurses Week Freebies 2019 Chipotle, Cinnabon, Chick-fil-A and more. We have the Big List of Free Stuff for Nurses Week. National Nurses Week in the United States will begin on Monday, May 6 and ends on Sunday, May 12. But, we should celebrate the good work nurses do every day! In other words, we appreciate you! 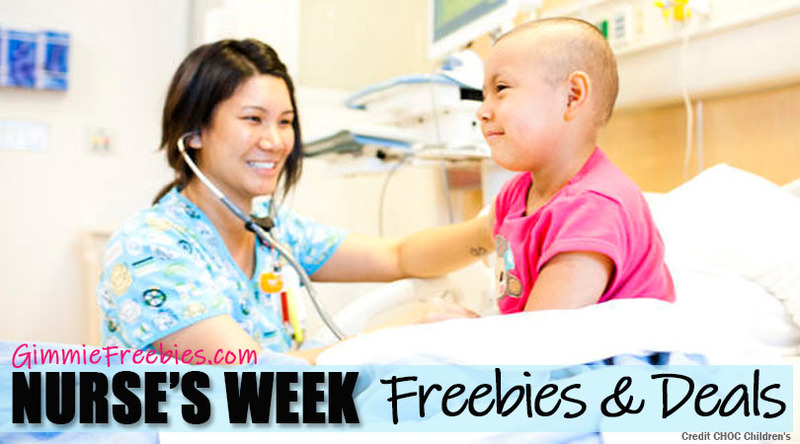 We hope you love this list of freebies & discounts for Nurses for Nurses Appreciation Week! Also, please share with your friends so they can take advantage of all the perks so deserving of these wonderful people! Certainly our thanks aren’t limited to Nurse Practitioners, RN or LPN / LVN either, this list includes all nurses including CNA and nursing aids / nursing assistants! My dad and my husband have spent far too much time in the hospital in the last year or so, and I know firsthand how hard nurses work and what life savers they are – literally! National Nurses Week begins on May 6 and ends on May 12, because May 12 is Florence Nightingale’s Birthday! Of course, she was a famous nurse in the 1800s who improved unsanitary conditions during the Crimean War. As a result, she and a team of nurses improved the unsanitary conditions at a British base hospital, reducing the death count by two-thirds. We’ve come a long way to Chick fil A Nurse Appreciation, but we’ll take it! All offers are May 6th – May 12th unless otherwise noted. Please check back as we update this list for 2019. Just a few of the fabulous freebies we’ve found, because we love nurses! Amazon – Head on over and browse all the Free Nursing Books, because they won’t last forever! Applebee’s Grill & Bar – promotions vary by location, so your neighborhood Applebee’s is the best place to start. You can also reach them toll-free at 888-592-7753 and they’ll be happy to check with any Applebee’s near you on your behalf. Chick-fil-A – Check with your local restaurant for Chick fil A nurses week participation, because each may offer great freebies for nurses! Chipotle – Nurses Week Freebies 2019 Chipotle offers round out some very tasty food this year! However, in 2017 and 2018 Chipotle announced that they’d have specials, just not during nurses week. Although last year they did offer a BOGO special for Teacher Appreciation Week. Come on, Chipotle!? Nonetheless, at participating Chipotle’s, every Wednesday is medical professional BOGO 50% OFF! Häagen-Dazs: May 14, 2019 is Häagen-Dazs’ Free Cone Day which is just after Nurse’s week this year. But, you don’t have to be a nurse to take advantage of the deal, which you can learn more about here. Texas Steakhouse & Saloon: Through May 12, nurses take $5 off a minimum purchase of $15 or more when they show their badge. Be sure to check back, because we will update this list often! Disney World – special discounts for nurses at the Swan and Dolphins resorts. Call 800-227-1500 and mention the code DREAMS. Mention that you are a nurse at the time of booking! Lydia’s Uniforms (now Uniform Advantage) – Nurses get 20 percent off nurse mates clogs, athletic wear and shoes. Use Code SAVE to save even more! Nature’s Gift – Nurses receive 10% off purchase price of essential oils and most other products with a current state license. They must have a copy of their license. PDQ – Will offer nurses who show their badges 50% off their total check on May 8th. Salus Medical Uniforms – Nurses can save 80 percent on nurse jackets, scrubs, uniforms and more. Sleep Number – Nurses can receive 35% off their purchases with license verification. WGU – Western Governors University has scholarships available and no-fee application during nurses week for additional schooling. CNA practice test – find it free here! Continuing Education Classes for Nurses – If you’re considering a career in nursing, then a great way to start is with a free class! Elsevier – Use coupon code 92635 to take 30 percent off nursing and other medical references and textbooks. Free shipping is included. Lippincott Williams – Take 20 percent off plus free shipping on any nursing package or nursing textbook with coupon code WZT51HFD. NetCE – All nurses and nurse practitioners can take a 23-credit online geriatrics course for $39 through the end of May. Nurse.com – Cardiology nursing courses start at just $10. Picmonic.com – Use coupon code BZ3OHCPRPQTHLK216 for 20 percent off your subscription, which can be applied to nursing or medical school through Feb. 9, 2018. RN.com – No coupon code needed. Get professional nursing topics starting at just $10. Skyscape – Use coupon code YGGU-DRPX-MION for 20 percent off the Daviss Comprehensive Handbook of Laboratory and Diagnostic Tests through the end of June. If you know of any more freebies, then share with us in the comments.